The facet joints are small stabilizing joints in the spine that allow flexibility and movement of the torso. Along with supporting the entire body, these joints also permit motions like bending over, twisting and rotating. Any issues with the facet joints can severely impair spinal function and give rise to various facet joint problems. Joint arthritis can also be referred to as facet joint syndrome. Much of this happens from the constant motion and occasional overuse of the spine. For instance, osteoarthritis results from wear and tear of the joints where the affected joints simply become degenerated. Facet joint disorders happen to be one of the most common and disabling neck and lower back problems. The severity of the condition depends on the extent of the damage with some causing serious symptoms and others resulting in disability for individuals. 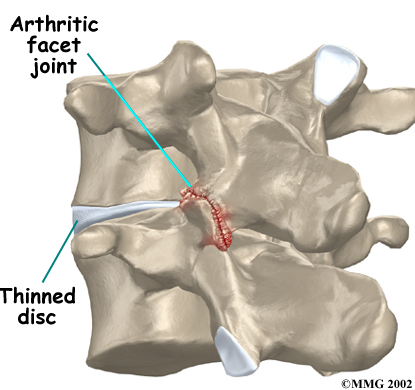 Treatment options for facet joint problems can be administered in a number of ways. Physical therapy is usually a long-term treatment program that focuses on soft tissue massage, stretching, improved alignment, joint mobilization and increasing the range of mobility and motion in individuals. Observing good posture while sitting and supporting the lower back. Heat or cold compresses using a heat wrap, taking a hot shower or using a hot water bottle can all help alleviate the associated discomfort. Likewise, a cold application using an ice pack can help soothe painful episodes. Anti-inflammatory medication can reduce the inflammation of osteoarthritis and act as an effective painkiller. A restraining collar for the neck is recommended for injury or degeneration in the neck facet joints. Injections for facet joint syndrome may be administered in a series with a 2 to a 4-week gap between each injection. Facet joint injections not only yield pain relief but can also pinpoint the exact place of origin of the pain. Facet joint rhizotomy is a procedure which involves using radiofrequency energy to destroy a part of the nerve inside the joint. This treatment method can provide relief from discomfort for up to 12 months. In cases with severe and persistent problems, surgery may be recommended. This option is only administered when conservative treatment options fail to provide relief. Surgery involves open spinal fusion which may mean adding bone graft to a segment of the spine. Surgical intervention typically involves a prolonged recovery period of 3 to 6 months along with physical therapy.